Welcome to RadioGuestList.com - Radio Guest List.com - How to Get Radio Interviews and Find Podcast Guests! Thank you for confirming your free email subscription to RadioGuestList.com! We're happy to have you as a member of our rapidly growing online community. Watch your email inbox over the next few business days. 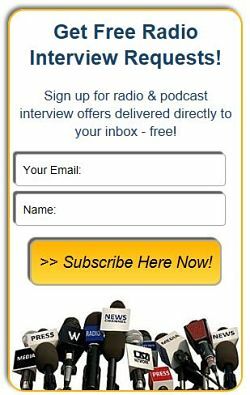 On Mondays, Wednesdays, and occasional Fridays, we'll be sending you free updates from talk radio hosts, podcasters, and TV talk show bookers looking for experts like YOU to interview. Just respond to each day's Guest Requests by email (don't email us!) and soon you'll be sharing your expert opinions on the air! Want TWICE as Many Interview Leads in your Inbox? The free basic edition of Radio Guest List will help your publicity efforts. But if you want even MORE high-quality new Guest Requests from radio shows and podcasts, upgrade to our PREMIUM Alerts service. You can choose from a Weekly Digest, Alerts targeted only to your favorite interview topics, or to simply get ALL the Guest Requests we publish each week. All automatically delivered to your inbox - starting at less than $5.00/month. It's a great deal - and the most affordable way you'll find to get you more radio interview publicity! Learn more about Radio Guest List Premium Service here now. Our Exclusive "How to Get Radio Interviews" Media Training! Ready to learn how to find the niche market shows that are most interested in your topics, books, and products, too? How about learning what to say (and what not to say) when you pitch radio producers? And the critical things you should NEVER say on the air if you want to be invited back? All these "radio insider" tips and much more are covered in our exclusive "How to Get Radio Interviews" Audio Training Course. Get a great deal on 4 exclusive hours of "behind the scenes" publicity tips and secret strategies directly from the Founder of RadioGuestList.com. Not available anywhere else, these MP3s can help you get more interviews to build a terrific on-the-air publicity campaign. Just click to learn more here now! the radio and podcast publicity you deserve. Have a great day. Thanks for joining us! p.s. Please click the share buttons below to tell your friends that you joined us!